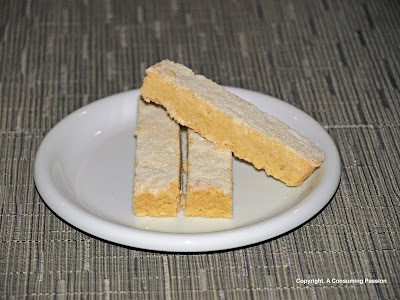 I have been a shortbread fanatic ever since I was a kid. I remember vividly the boxes of Walkers shortbread that always came in festive hampers in Singapore. Usually, I find that the contents of these gift hampers usually leave much to be desired but Walkers shortbread, for me, was the exception. These were what I would always plead with my parents to open the hamper for. Interestingly enough then, since I started baking heavily, I have never attempted to make my own shortbread. No real reason, I suppose, other than the fact that there are just too many recipes to choose from. Having recently been on a short trip to Edinburgh, where I had a fantastic shortbread at the Edinburgh castle, I was inspired to finally attempt my own. Comparing the various recipes that I found in my books, I finally settled on this one from Tartine which uses cornstarch to make the shortbread very tender. Other recipes that I saw either omitted this or used rice flour instead of cornstarch. The two main things that concerned me about making the shortbread were excessive spreading of the cookie and being able to cut the shortbread cleanly without breaking them. Thankfully, neither of them really posed a problem. I got around the first issue by baking my shortbread in a rectangular fluted tart pan, which meant there was really no way they could spread sideways. As for the second, I followed the recipe's instructions to slice them while still warm, but to remove them from the baking dish only after the shortbread had been thoroughly chilled (I left mine overnight in the refrigerator, wrapped well with clingfilm). Seeing as it was my first attempt at shortbread I was extremely happy with the results. The cookies did indeed have a tender and crumbly texture. I must say though that I prefer my shortbread with a bit more crunch. Next time then, I'll try a recipe without the cornstarch. If you like melt-in-your-mouth cookies though, this one's for you. Preheat the oven to 325F. Butter a 6-by-10-inch glass baking dish (or baking dish of your choice with approximately the same dimensions). Place the butter in a mixing bowl. The butter must be very soft - the consistency of mayonnaise or whipped cream. Add the salt to the butter and mix well with a wooden spoon or whisk so that it dissolves completely before you add the rest of the ingredients. Sift the flour and cornstarch together into a bowl. Add the granulated sugar to the butter and mix until just combined. Add the flour mixture and mix just until a smooth dough forms. Pat the dough evenly into the prepared baking dish. The dough should be no more than 2/3 inch deep. Bake until the top and bottom are lightly browned, about 30 minutes. The middle of the shortbread should remain light. Let cool on a wire rack until warm to the touch. Sprinkle the shortbread with the superfine or granulated sugar. Tilt the dish so that the sugar fully and evenly coats the surface and then tip out the excess sugar. 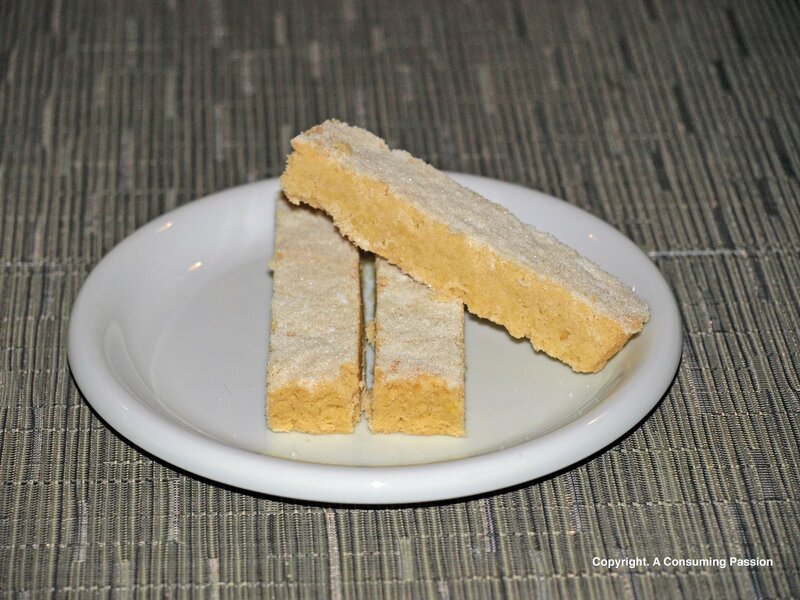 With a very thin, sharp knife, cut the shortbread into rectangular fingers about 1/2 inch wide and 2 inches long. If the cookies have become cold they will not slice well, so they must still be warm to the touch at this point. Chill thoroughly before removing from the baking dish. They sure do sound wonderful! I love shortbread as well.